There is growing recognition among state policymakers that improving health outcomes is as much about addressing the social determinants of poor health as it is about providing high-quality medical care. Accountable care collaboratives, including Medicaid accountable care organizations (ACOs) or other ACO-like models, offer prime opportunities for states to meld population health and payment and delivery system reforms. The paper was commissioned by the Milbank Memorial Fund-supported Reforming States Group, a bipartisan, voluntary group of state health policy leaders from both the executive and legislative branches who, with a small group of international colleagues, work on practical solutions to pressing problems in health care. 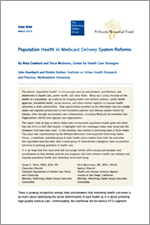 This issue brief, “Population Health in Medicaid Delivery System Reforms,” focuses on strategies that inform ACO design and governance structures, program components, metrics, and information-sharing mechanisms—and it includes some promising early examples of states working to embed population health strategies in Medicaid ACOs.